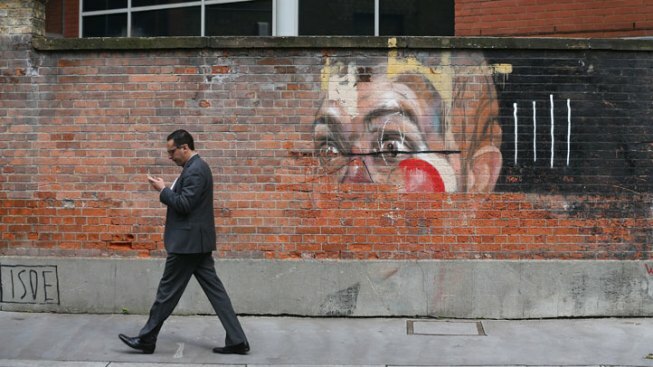 A man uses his mobile phone as walks in London. A new study states that one in three pedestrians is distracted while walking. Nearly one in three pedestrians is distracted by a mobile device while crossing a busy street, and texting appears to be the most distracting and potentially most dangerous activity, according to a new study. The study, published Wednesday in the journal Injury Prevention,looked at pedestrians crossing 20 busy intersections in Seattle in the summer of 2012. It concluded that nearly one out of three pedestrians was engaged in some distracting activity, including taking on the phone, listening to music, talking with others, or dealing with children or pets. Pedestrians who were texting took, on average, 2 seconds longer to cross busy streets and were less likely to pay attention to traffic while doing it. Distracted drivers took the lives of more than 3,000 people in 2010, according to the National Traffic Highway Safety Administration, which has an ongoing initiative related to the issue. Cell phone use was reported in 18 percent of all distraction-related fatalities, according to the NTHSA. State legislatures have taken notice. Handheld cell phone use while driving is banned in 10 states and the District of Columbia and texting while driving is banned in 39 states, according to the Governors Highway Safety Association. The authors of the distracted pedestrian study recommend studying intervention efforts to reduce the risk of pedestrian injury. They suggest an approach similar to the "don’t drink and drive" campaign.